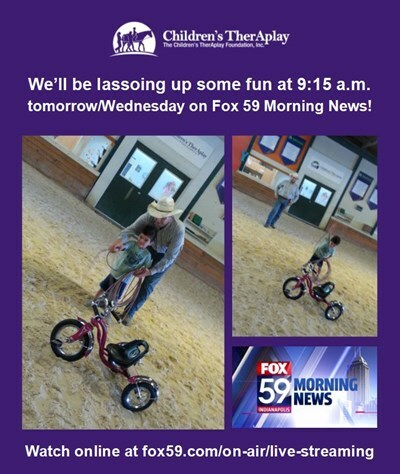 You don’t usually (okay, ever) see anyone taking roping lessons at Children’s TherAplay, but today was different because tomorrow/Wednesday, at 9:15 a.m. physical therapist Miss Teresa will be on FOX59 News talking about treatment at Children’s TherAplay … and the Sept. 22 Hoe-Down! Two friends will be helping her out. And Ryan the roper will be giving the Fox 59 team a feel for one of the fun new elements at the Children's TherAplay Hoe-Down: mechanical calf-roping. The mechanical calf is in northern pastures at the moment, so Ryan’s going to show the anchors how to lasso a tricycle. You can watch the live stream of the segment here at 9:15 to see how the Fox 59 folks do. And then rope up your Hoe-Down tickets here. UPDATE: Missed the live segment? Enjoy it here.